Sarah Scharbrough McLaughlin is a singer/songwriter and worship leader from Indianapolis, Indiana. While she could name a whole slew of artists she has toured with, opened for, and recorded with, the truth is that she is just making it all work like everyone else. She has worked with some fantastic people and some pretty crappy ones too. She has played arenas and sung nationally known jingles. She has also played lousy gigs until exhausting hours where only four people showed up and she was the opener for a mediocre clown act. Like, literally a clown. And that is just in the last month. She has had a solid musical career with many amazing opportunities all over the world and five studio albums released, but she has committed serious career murder by taking off for long maternity leaves with each of her five children. Nonetheless, she has stood behind her decision to do so and the Lord has graciously worked it all out. She has been dropped off tours with no notice as many performers have experienced. She has been told by Christian labels to "tidy up" the gospel and say the name of Jesus more. She has been told by mainstream labels that she's not quite "pop" enough. She has also worked in many churches and sometimes been told that working in the church as a woman means 'sometimes the church wins, sometimes family wins.' She has dug in her heels and said 'then no one wins.' Somehow in the Lord's kindness, He continues to connect Sarah with people through song and story in her genre-crossing, honest musical material. She will likely be a little slow returning your call/email/tweet/FB message/text, scattered upon arrival, will need a room to pump breastmilk, and will probably overshare, but despite these oddities, she will pray for your event, have her heart completely engaged, and love the new friends she'll meet. They will go on to keep in touch for years. (Don't worry; her manager will help make sure details are taken care of!!!) She will laugh and cry with her audiences and her songs will resonate with folks young to old. Though she has chosen a life of ministry (or maybe it has chosen her), she still dreams about tropical vacations and really wants to drive a Lexus SUV someday thanks to her vast experience driving her grandparents’ expensive cars. Knowing that these things are perhaps pipe dreams, she is not in this to make money. She has seven mouths to feed, but if she can make it happen to join you, she absolutely will. Especially if you follow through and promote/mention her CDs like you say you will. Don't let the finances be the reason that you don't connect. Yes, musician is part of her title. But a far more important role to Sarah is that of wife, mother, friend, neighbor, and, mostly, daughter of the King. Sarah fills her time with raising her 5 children under 9 years old, cooking, shoving stuff in closets before her housecleaner comes, laundering cloth diapers, singing songs throughout the house, texting her husband 'important' things, looking online at Target.com, packing lunches, leading worship at conferences, doing concerts in clubs, replacing the toilet paper rolls, reading, laughing with her small group, blogging, doing musical studio session work, having people over for dinner, and driving her kids all over the county for school/playdates/sports/lessons. And she is incredibly thankful for all of it. Her main events include women's retreats and conferences, house concerts, worship leading/mini-concerts in churches and church events, choral and other guest artist events, private/corporate parties and festivals. Oh and opening for clowns. If you are still willing to take the risk after reading her bio, now is the time to book or share your event. Everyday sanctuaries. As a worship leader, songwriter, and performer, Sarah Scharbrough McLaughlin has led worship at churches, events, and gatherings worldwide. Her greatest platform though is leading a spirit of worship as a wife of 16 years to her best friend Jeff and mother to her 5 young children. Sarah has a heart for creating sacred spaces. While this began leading worship through music, it has developed as she has sought to connect audiences in story, song, and emotion and as she has raised her children singing, laughing, learning in their own home. It is, in fact, all leading worship. Using her classical and jazz background and incorporating some gospel, country, and pop, she writes about life with depth, sincerity, raw emotion and humor. Sarah’s soulful and eclectic sound have landed her work with Grammy-award winning musicians, collaborating and sharing the stage with Bill and Gloria Gaither, Sandi Patty, Kurt Elling, Watermark, Jon McLaughlin, Alanna Story, Cook & Belle, Dierks Bentley and a slew of other impressive talents. She has also served as the voice for many local and national commercial/radio jingles including New Balance, the Indpls Colts, and Cedar Point theme parks among others. Sarah has released 5 albums including "So Many Reasons", "The Least of These", “Draw Me Back”, “The Bright Midwinter - A Christmas Meditation” and, most recently, “Sit With Me”, an album she co-produced with Jon McLaughlin. Sarah’s newest endeavor is a project called “Everyday Sanctuary”. 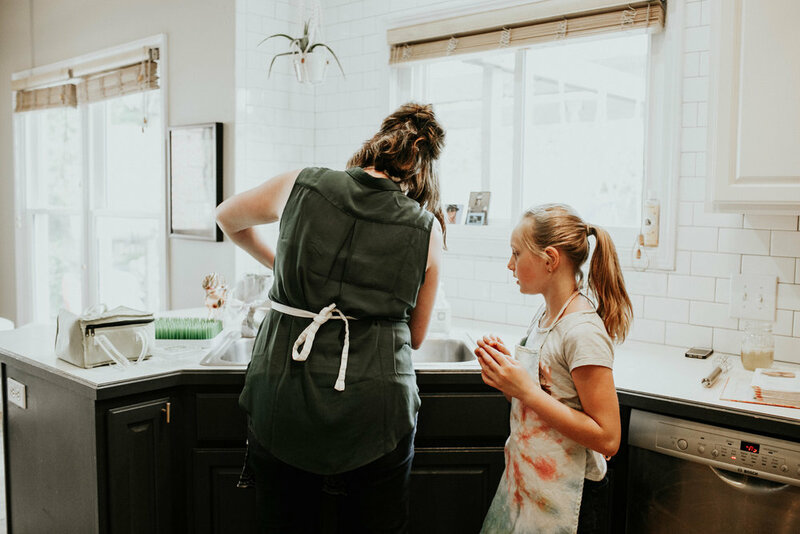 It is a quarterly subscription service rolling out later this year to help other young families create faith-based, fun-inspired, everyday sanctuaries through family-friendly experiences at home.